The Bruderhof (/ˈbruːdərˌhɔːf/; German: place of brothers) is a Christian movement that practices community of goods after the example of the first church described in Acts 2 and Acts 4. They have communities in the United States, the United Kingdom, Germany, Paraguay, and Australia. The Bruderhof is seen as Anabaptist due to its beliefs and practice, and their claim that another life is possible. The Bruderhof practices adult baptism, non-violence and peacemaking, full community of goods, the proclamation of the gospel and lifelong faithfulness in marriage. The communities are best known by the name "Bruderhof" or sometimes "Bruderhof Communities", though "Bruderhof" is the name used on their website. The communities are legally incorporated in the US as "Church Communities International". Their corporation used to be called The Society of Brothers (1939 to 1978). When the Bruderhof was part of the Hutterite Church, they were sometimes called "Hutterian Brethren". The word "Bruderhof" was first used by the early Anabaptists in Moravia. The Bruderhof was founded in Germany in 1920 by Eberhard Arnold, a philosophy student and intellectual inspired by the German Youth Movement and his wife Emmy, née von Hollander. In 1920 the young family with five children rented a house in Sannerz, Germany and founded a Christian community. When the group outgrew the house at Sannerz, they moved to the nearby Rhön Mountains. While there, Arnold discovered that the Hutterites (an Anabaptist movement he had studied with great interest) were still in existence in North America. In 1930 he traveled to meet the Hutterites and was ordained as a Hutterian minister. With the rise of Adolf Hitler and Nazism, the Rhön community moved its draft-age men and children to Liechtenstein around 1934 because of their conscientious refusal to serve in the armed forces and to accept Nazi teachers. This community became known as the Alm Bruderhof. 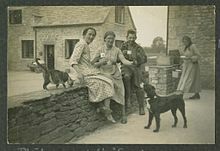 Continuing pressure from the Nazi government caused others to move to England and found the Cotswold Bruderhof in 1936. On April 14, 1937, secret police surrounded the Rhön Bruderhof, confiscated the property, and gave the remaining community members forty-eight hours to flee the country. By 1938, all the Bruderhof members had reassembled in England. Avila Star – one of the boats that transported the Bruderhof to Paraguay. While in England, the population grew to over 350 members, largely through the addition of young English members seeking an alternative to war. Even before the outbreak of World War II, the community's German members and its pacifist stance attracted deep suspicion locally resulting in economic boycotts. When confronted with the option of either having all German members interned, or leaving England as a group, the Bruderhof chose the latter, and began to look for refuge abroad. Soon after the United Kingdom entered the war, the Bruderhof emigrated to Paraguay—the only country that would accept a pacifist community of mixed nationalities. This move was assisted and facilitated by the Mennonite Central Committee. Starting in the hostile Chaco region, the Bruderhof then relocated to eastern Paraguay where three settlements were founded on a large tract of land called Primavera. Bruderhof members founded a hospital for community members and local Paraguayans. The only clinic in the area, it served tens of thousands for the next two decades. By the early 1960s, the community in Paraguay had grown significantly and was attracting visitors from North America. In 1942, several leaders of the community came in conflict with a group of members over the community's trajectory. This group, which included the founder's wife Emmy Arnold, argued that the founder's vision was rooted in a pietistic faith in Jesus Christ, not primarily in communitarian ideals. Eventually the church leadership, headed by the founder's son-in-law Hans Zumpe, banished the dissidents from the Bruderhof. Those who supported them were silenced, often with harsh discipline. Eventually allowed back to join their families, the dissidents re-joined the community. One of them, Johann Heinrich Arnold, a son of Eberhard and Emmy Arnold, was sent with his family to the United States to raise funds and eventually started a new community called Woodcrest, in Rifton, New York, in 1954. Over the following years, conflicts between Zumpe and Arnold continued, culminating in a crisis resulting in Zumpe being relieved of his leadership role by the community. Zumpe left the community in 1960 after revelations of personal issues. Many members who supported Zumpe, and some who were confused by the turmoil, left or were asked to leave the community. Eventually, the communities in Paraguay were dissolved and the members who remained relocated to the United States. Many of those who left the community during the 1960s later returned, but some remained outside of the community and formed a group of critics of the Bruderhof. Their stories formed the basis for the 2000 book written by Julius Rubin, The Other Side of Joy: Religious Melancholy among the Bruderhof. Rubin himself never visited the Bruderhof. In 2010, the Bruderhof opened the Villa Primavera Community in Asunción, Paraguay. In 1954, the Bruderhof started a settlement known as the Woodcrest Bruderhof in the United States near Rifton in upstate New York, in response to a dramatic increase in the number of American guests. Woodcrest absorbed the Macedonia Cooperative Community in Georgia and many members of the Kingwood Community in New Jersey. Through the Macedonia Cooperative Community Woodcrest inherited the business Community Playthings. Additional new communities were founded in Pennsylvania (1957) and Connecticut (1958). In 1990, the Spring Valley Bruderhof was founded adjacent to the New Meadow Run Bruderhof in Farmington, Pennsylvania. As of September 2017, there are a total of 13 Bruderhof communities in the United States. In 1971, the Bruderhof purchased a property in Robertsbridge, East Sussex, United Kingdom called Darvell. The property had previously been a tuberculosis hospital. In 1995 a former sports college in Kent was purchased. 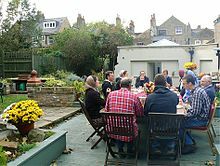 In 2005, the Bruderhof started a small community in East London. This urban Bruderhof has now been moved to Peckham in London. In 2002, the Bruderhof purchased a house in Sannerz, Germany. This location is where the Bruderhof movement had originally started. As of September 2017, there are three Bruderhof Communities in the United Kingdom and two in Germany. The Bruderhof opened a community in Elsmore, New South Wales, Australia in 1999. In 2005, the Bruderhof opened a community in Inverell, New South Wales, Australia, where they operate the sign-writing business Danthonia Designs. Also in 2005, the Bruderhof opened a community in Armidale, New South Wales, Australia. The Bruderhof is a Protestant, evangelical Christian group, strongly influenced by radical Anabaptist and early Christian beliefs. Eberhard Arnold drew inspiration from a number of historical streams including early Christianity, the Anabaptists, German Pietism and the German Youth Movement. Johann Blumhardt (1805–1880) and his son Christoph Blumhardt (1842–1919), both German Lutheran theologians, are important sources of Bruderhof piety. The Bruderhof practice Christian pacifism and therefore reject the practice of conscription, reflecting the early Anabaptist beliefs formulated in the Schleitheim Confession. The Bruderhof tries to follow the practices of the first church in Jerusalem as related in the Acts of the Apostles, for example Acts 4:32–37: where the church members were of "one heart and mind, and shared all things in common". Bruderhof members do not hold private property, but rather share everything. Members work inside the Bruderhof, and nobody receives a salary or has a bank account. Income from all businesses is pooled and used for the care of all members and for various communal outreach efforts. It is therefore out of the question for someone in our community to hold something against a brother or sister or to talk behind his or her back. Relationships within and to the church community are spiritual bonds based on trust and on the readiness to forgive again and again. The Bruderhof believes marriage to be "the lifelong union between one man and one woman" and believes that sexual love should only be shared in such a marriage relationship. They believe divorce and remarriage to be wrong. It has supported and run marriage events to promote marriage between one man and one woman both in the United States and the United Kingdom. The Bruderhof also participated in Humanum, a conference held in the Vatican from November 17–19, 2014 and attended by Pope Francis to discuss the complementarity of man and woman. In accordance with the Anabaptist doctrine of nonconformity to the world, the Bruderhof wear plain dress, with women donning Christian headcoverings in accordance with their interpretation of 1 Corinthians in the Christian Bible. Most communities have a nursery, kindergarten, school, communal kitchen, laundry, various workshops, and offices. Bruderhof life is built around the family, though there are also many single members. Children are an important part of each community and participate in most communal gatherings. Disabled and elderly members are loved and cared for within the community and participate in daily life and work as much as they are able. The Bruderhof eats one meal together each day as a community. Other meals are eaten in families. Singing is a very common form of worship in the community, and members often sing before meals. The Bruderhof do not prohibit the consumption of alcohol. Membership in the Bruderhof is a voluntary, adult decision and should be made with the full knowledge of what non-Bruderhof life is like. Numerous guests visit the Bruderhof and all communities are open to guests. The Bruderhof is estimated to have around 2,900 members worldwide. They rarely appear in the mainstream media, but sometimes allow photographers or journalists to observe their life. The Bruderhof has a reserved attitude to the use of technology. Bruderhof families do not watch television or use the internet at home, but some do use smartphones. Unlike the Amish however, they own and drive cars and run modern businesses and factories. The Bruderhof was an early adopter of the internet, registering the domain bruderhof.com in 1996 and using it to publish information about the Bruderhof and to publish e-books. They shut down their websites in 2005, but brought them back online in 2006. They now run two main websites (bruderhof.com and plough.com) and several social media channels. Some of their members run video blogs that document their life on the Bruderhof that are published online. The Bruderhof runs schools for the children on each community, up to the age of 18. From there, young people go onto further education at university or do a practical training. They do not automatically become members, and many are encouraged to leave the community and live elsewhere before deciding on their own whether or not to join the community. Young people who leave the community are not cut-off from their families within the Bruderhof. The Bruderhof run a variety of businesses that provide income to run their communities and provide common work for the members who almost all work onsite. Community Playthings was developed during the 1950s and soon became the Bruderhof's main source of income. Community Playthings designs and manufactures quality wooden classroom and play environments for schools and daycare centers. The business is run by the communities in the United States and United Kingdom. Rifton Equipment, run by some of the American communities, sells mobility and rehabilitation equipment for disabled adults and children. It was founded in 1977. Danthonia Designs is the business that supports the Australian Bruderhofs. It specializes in hand-carved three-dimensional signage and was founded in 2001. The Bruderhof is actively involved in the neighborhoods that surround its communities and in the world at large. The Bruderhof sees justice and the works of mercy as a gospel command. They foster many ecumenical relationships with other churches and denominations. For instance, in 2019 the Bruderhof collaborated with the Coptic church to commemorate the Copic martyrs killed by ISIS. Members met the Pope in Rome in 2004. Bruderhof members serve on school boards, volunteer at soup kitchens, prisons and hospitals, and work with local social service agencies such as the police to provide food and shelter for those in need of help. They are active supporters of various international aid organisations, such as Oxfam, Save the Children, Tearfund, and World Vision. The Bruderhof's Plough Publishing House publishes books and a magazine called Plough Quarterly. Plough publishes spiritual classics, inspirational books, and children's books, some of which are available as free downloads. Some of the books are written by Bruderhof members, but others are not. In response to the Columbine High School massacre in 1999, the Bruderhof created a program of school assemblies that have now reached tens of thousands of youths in the United States and United Kingdom. Operating under the name "Breaking the Cycle", speakers with forgiveness stories speak to children at school assemblies. The Bruderhof community has at various times campaigned on social issues, such as the death penalty and the Iraq War. They were involved in the campaign in opposition to the death sentence for the activist Mumia Abu-Jamal, who was convicted in 1982 of murdering a Philadelphia police officer. The Bruderhof Communities and the traditional Hutterites were in fellowship between 1930 and 1955 and between 1974 and 1990. In 1990, the Lehrerleut and the Dariusleut withdrew, while the Schmiedeleut maintained their bond to the Bruderhof. After the split among the Schmiedeleut in 1992, the more traditional group also withdrew, while the more progressive branch (led by Jacob Kleinsasser) kept the bond until 1995. Since then, the traditional Hutterites and the Bruderhof have been separate groups. The reason for the withdrawal of the Hutterites in 1955 was a conflict about the Forest River Hutterite Colony, which joined the Bruderhof by a majority vote. In 1974 there was reconciliation between the two groups. In 1990 two of the three branches of the traditional Hutterites withdrew over concerns in regard to education, worship services and relations with outsiders. According to Rod Janzen, there are differences between the traditional Hutterites and the Bruderhof Communities on many fields. Besides cultural differences, there are differences in regard to education, leadership, decision making, church discipline, ecumenism, what constitutes the "Word of God" etc. All these differences led to the final break in 1995. ^ "Radical Discipleship Lived in Our Midst - Catholic New York". cny.org. Retrieved April 27, 2017. ^ Murray, Stuart (2011). 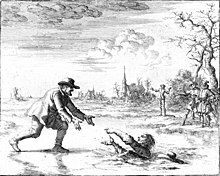 The Naked Anabaptist. Paternoster. ISBN 978-1-84227-725-6. ^ a b Jones, Keith G.; Randall, Ian M. (December 5, 2008). Counter-Cultural Communities: Baptistic Life in Twentieth-Century Europe. Wipf & Stock Publishers. p. 310. ISBN 9781606083161. Through this action, the Bruderhof remained faithful to the early Anabaptist beliefs as described in The Schleitheim Confession, in particular through the refusal to accept obligatory military service in accordance with the confession's statement that 'the rule of the government is according to the flesh, that of the Christians according to Spirit'. ^ a b "Foundations of our Faith and Calling". Retrieved November 16, 2016. ^ Merrill Mow: Torches rekindled: the Bruderhof's struggle for renewal, Ulster Park, NY, 1989, page 30. ^ "Bruderhof - GAMEO". gameo.org. Retrieved September 28, 2017. ^ Tyldesley, Mike (2003). No Heavenly Delusion? : A Comparative Study of Three Communal Movements. Liverpool University Press. ^ Randall, Ian M.; Wright, Nigel G. (March 14, 2018). A Christian Peace Experiment: The Bruderhof Community in Britain, 1933–1942. Cascade Books. ISBN 978-1-5326-3998-2. ^ "Does anyone know how we can entice our house martins back? | The Spectator". The Spectator. July 7, 2018. Retrieved July 6, 2018. ^ Levinson, David; Christensen, Karen (2003). Encyclopedia of community: from the village to the virtual world, Volume 3. Thousand Oaks, CA, USA: Sage Publications. p. 105. ^ Barth, Emmy (2009). No Lasting Home: A Year in the Paraguayan Wilderness. Plough. ISBN 978-0-87486-945-3. ^ "Community in Paraguay – A Visit to the Bruderhof | Skirt | Altar". Retrieved July 21, 2017 – via Scribd. ^ Mommsen, Peter. Homage to a Broken Man. Plough. ISBN 978-0-87486-613-1. ^ Julius H. Rubin: The Other Side of Joy: Religious Melancholy among the Bruderhof, New York and Oxford, 2000, pages 132-155. ^ a b Randall, Ian M. (October 1, 2014). "Church Community is a Gift of the Holy Spirit - The Spirituality of the Bruderhof Community". Rochester, NY: Social Science Research Network. SSRN 2536364. ^ "Where We Are". Bruderhof. Retrieved September 20, 2017. ^ "communityplaythings.com – Our History". communityplaythings.com. Retrieved November 23, 2016. ^ a b "Danthonia Designs". Retrieved November 19, 2016. ^ "Guides". Bruderhof. Retrieved November 24, 2016. ^ "Charles E. Moore, Radical, Communal, Bearing Witness: The Church as God's Mission in Bruderhof Perspective and Practice". missiodeijournal.com. Retrieved December 6, 2018. ^ The Bruderhof: Foundations of our Faith & Calling; The Bruderhof; The Plough Publishing House, Rifton, New York 2012. ^ Foundations of our Faith and Calling. Plough. 2014. pp. 29, 50. ISBN 978-0-87486-888-3. In obedience to this commission, the church community offers baptism to every person who believes in the gospel of Jesus Christ and whose repentance comes from the heart, bearing fruit in deeds. In order to receive believer's baptism as instituted by Christ for the forgiveness of sins, a person must have reached the age of accountability. ^ Foundations of our Faith and Calling. Plough. 2014. pp. 58–61. ISBN 978-0-87486-888-3. ^ "Marriage event in London". Retrieved November 22, 2016. ^ "Man, Woman and Family: Convergence Among Faiths". Retrieved November 22, 2016. ^ Bronner, Simon J (March 4, 2015). Encyclopedia of American Folklife. Routledge. p. 492. ISBN 9781317471950. ^ "Life Among The Bruderhof". The American Conservative. Retrieved April 24, 2017. ^ "Bruderhof Communities". SoundCloud. Retrieved May 31, 2018. ^ "Learning from the Bruderhof: An Intentional Christian Community". ChristLife. Retrieved July 19, 2017. ^ "Visit Us". Bruderhof. Retrieved November 26, 2016. ^ "Bruderhof Website - Another Life is Possible". Retrieved November 19, 2016. ^ "A Day With The Bruderhof". james clarke photography. Retrieved June 29, 2018. ^ "Has anyone had experience with the Bruderhof community? - Quora". quora.com. Retrieved July 20, 2017. ^ Wells, Rev Scott (January 10, 2006). "Bruderhof update". Rev. Scott Wells. Retrieved July 20, 2017. ^ "The Bruderhof (@TheBruderhof) | Twitter". Twitter. Retrieved July 20, 2017. ^ "Bruderhof (@bruderhofcommunities) • Instagram photos and videos". instagram.com. Retrieved July 20, 2017. ^ "Bruderhof". Retrieved June 29, 2018 – via YouTube. ^ "Education". Bruderhof. Retrieved November 26, 2016. ^ Marans, Daniel (June 25, 2018). "Local Politics, Not Trump, Dominate In Key New York Swing District". HuffPost. Retrieved June 29, 2018. ^ "Where We Are". Bruderhof. Retrieved November 24, 2016. ^ "Community Playthings". Retrieved November 19, 2016. ^ "communityplaythings.com - Community Playthings - Childcare Furniture for over 60 years". communityplaythings.com. Retrieved December 5, 2016. ^ "Community Playthings | Nursery school furniture and equipment". www.communityplaythings.co.uk. Retrieved December 5, 2016. ^ "Rifton Website". Retrieved November 19, 2016. ^ Levin, Steve (July 21, 2000). "Bruderhof youth festival readied". Pittsburgh Post-Gazette. Retrieved September 21, 2013. ^ "Why I Keep Talking About…Alternativity, the Bruderhof, and Church of All Nations". Proximity. October 23, 2017. Retrieved October 24, 2017. ^ "Lots of Coptic clergy were rubbing shoulders with members of the Bruderhof". The Tablet. Retrieved March 15, 2019. ^ "To the members of the "Bruderhof Communities" (June 26, 2004) | John Paul II". w2.vatican.va. Retrieved April 13, 2019. ^ "Common Causes". Bruderhof. Retrieved November 19, 2016. ^ "Strategic Partners". Save the Children. Retrieved November 19, 2016. ^ "Alien Citizens | The University of Chicago Divinity School". divinity.uchicago.edu. Retrieved July 7, 2018. ^ "About Us". Plough.com. Retrieved May 1, 2013. ^ "Breaking the Cycle". breakingthecycle.com. Retrieved November 19, 2016. ^ Tapia, Andres; Carrasco, Rudy (June 21, 2007). "A Christian Community Makes Waves, Not War". Christianity Today. Retrieved September 23, 2013. ^ a b Rod Janzen: The Hutterites and the Bruderhof: The Relationship Between an Old Older Religious Society and a Twentieth-Century Communal Group in Mennonite Quarterly Review 79 (2005), pages 505-544. ^ Merrill Mow: Torches rekindled: the Bruderhof's struggle for renewal, Ulster Park, NY, 1989, page 29-31.